The property of 30,750 square meters is a private park within a protected natural park, located in the highest altimetric area of ? ?Arquà Petrarca in one of the most beautiful slopes of the Euganean Hills. The land cultivated with a hundred Giuggioli and 340 Olives of 8 different varieties that produce Extra Virgin Olive Oil. Your house is reached via a private road of about 200 m, with at the entrance a gate equipped with video surveillance and intercom, once inside you have the opportunity to move freely throughout the property without being seen and disturbed by anyone. ll rustic single completed in 2011 is located as on a balcony, with a 180 ° view of the Po Valley, which often allows you to see the Apennines on the horizon. Structured as required by current regulations, however, is characterized as a typical local habitation, for the facade has in fact been reused the stone of the old pre-existing ruin, the roof and the inside porch has been realized with wooden beams and original terracotta tiles, recovered from a single ancient roof and around the house there was a paving in original stone of a Piazza di Venezia. Disposed on 2 floors of about 260 square meters including porch, is composed on the ground floor by a large open space compartment (4,40x12 m approx.) 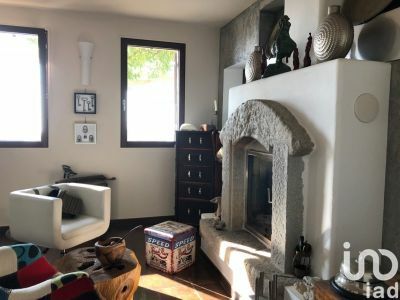 With sitting room, dining room and at the bottom an Austrian fireplace with a relaxing lounge, a bathroom with shower, kitchen with peninsula, laundry with main entrance door and a room to be used as a study or bedroom. All the upper floor, apart from the bathrooms, there is a floor in hand-planed and brushed Oak, the part surrounding the staircase is open space with study and library, we also find 1 bedroom with walk-in closet and bathroom included of shower, 1 guest bedroom, main bathroom with corner bath. The roof and the porch were made of wooden beams and original terracotta tiles, recovered from a single ancient roof. Ca mino Austrian stube, with accumulation of hot water that complements the underfloor heating. Hydraulic and electrical systems (particularly sought-after lighting system) certified CEE.